It's Gift of Gab Monday. 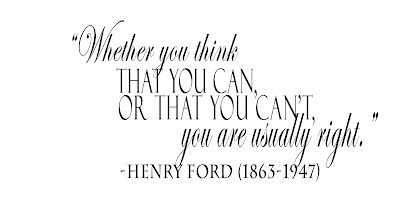 Today's quote is a favorite of mine. I have "borrowed" it many many times and used it on my kids, much to their dismay. Use it on a gift tag paired with music lessons or cooking lessons. How about a gift certificate for sky diving or dare I say bungee jumping? Maybe they have always wanted to try roller skating or even surfing. Have someone that is hard to buy for...give them a gift of something they have always wanted to try and write this quote on the gift tag. Inspiration for a gift can hit you over the head from just about anywhere. This photo from Lord Willy's was spotted over at the bedlam of beefy. 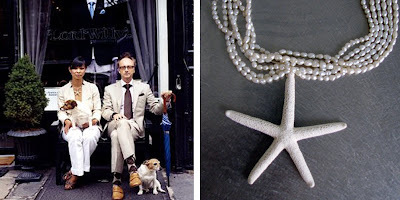 The photo really works on so many levels, but I zeroed right in on the starfish necklace. There is something about that classic and whimsical style that is ever so appealing. I attached a starfish to a strand of fresh water pearls. Don't have pearls, try a vintage piece of ribbon. This could even be made into a bookmark. 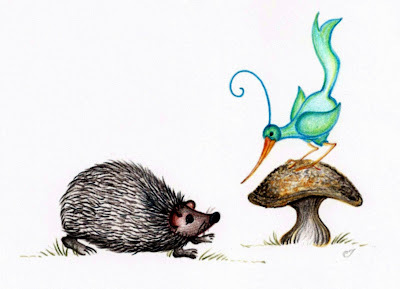 So, the moral of the story is...no matter where you are or what you are doing, keep your head down because inspiration could be about to land. The other night I was perusing the very inspiring blog, habitually chic. The blogger behind habitually chic works for a top interior design firm in New York City. The photos are loaded with inspiration. Many of them give you that ache inside that you get when you know you have seen a photo of your dream style, but I digress. 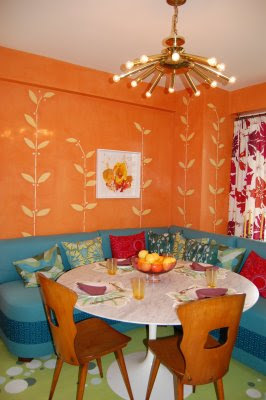 When I came across this photo from Sara Bengur Interiors (April 27, 2008), I instantly thought that anyone who has breakfast in a room like that must be very cheery....whether they start out that way or not. That got me to thinking about people I know that always start the day in a cheery state of mind. That inspired me to think that it would be fun to fill a basket or tray with eggs, toast, a favorite jam (check out we love jam), orange juice, and some flowers and leave it at the door of a friend. Be sure to tie on a note that says, "Thanks for always starting your day sunny side up." "Sometimes, I've believed as many as six impossible things before breakfast." There's nothing quite like a new journal. All those clean pages. Oh the possibilities just waiting to be put to paper. I usually have several journals going at once, but I never get over that feeling of starting a new one. Contact me directly for information on the journals shown here. It doesn't always take a pea and a stack of mattresses to recognize a princess. This tiara is handmade exclusively for us at sea and jae. It can be made in any colors. 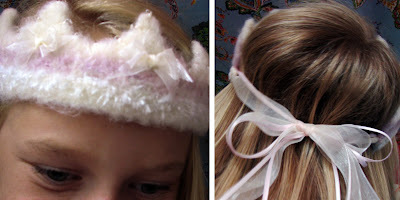 I know one little girl who wears hers every year for her birthday (and any day in between that she thinks she is a princess). In fact, that's how this item originated. It was such a loved birthday gift, that after a couple of years of birthdays, we knew we had something special. It would even make a fun gift for an "older" birthday princess. Who says the sparklers, cupcakes, and tiaras have to go away when you're not a little girl anymore? I also think it has just the right touch of sweetness and sentimentality to be a new baby girl gift. I like when gifts can start traditions and with this worn every year on her birthday, it does just that. Email me directly if you want more info. It's so new that it's not even listed on our site yet. Finding inspiration for giving the right gift can come from anywhere. Take a look at this interiors shot from livingetc. magazine. A very calm, quiet and elegant room. Have a friend with the same qualities? 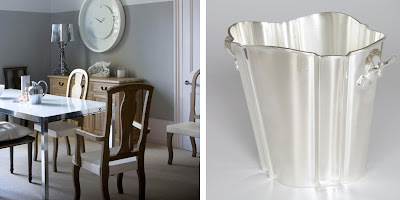 How about this silver ice bucket with a special note that says, "because you are the calm and elegant rock in my life". Since I always love to take things a step further...fill it with beach rocks you collected yourself. Gift giving is story telling. 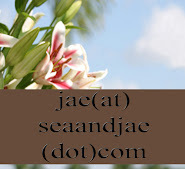 Today I wanted to show you an invitation that was just completed. For awhile now, I have been going to a beautiful nearby state park and "cleaning up" the beach. 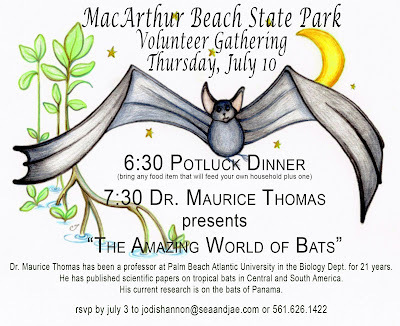 (More on that another time) I recently became an official volunteer there and offered my services in helping put together their regular volunteer gatherings. 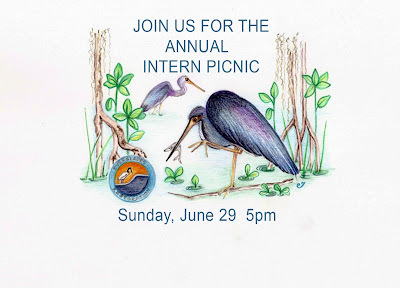 As you can imagine, a state park has a very limited budget for any events such as this. These invitations will only be sent out via email. That being said, I still believe those volunteers need to feel the appreciation that the park so obviously feels towards them. This is the sort of extra touch that shows that. Don't ever forget to go that extra mile for someone....it always shows! Many times people spend so much time on the gift, they don't think about the presentation of it or the gift tag. A gift tag is like frosting on a cake. It's okay without it, but so much better with it. Today, I played with some words on a scrabble board to make gift tags. Just photograph the words, print them on hard paper, punch a hole, and tie on a ribbon. Starting top left and moving clockwise: Attach this to a pocket size calendar and send to a friend you haven't had time to catch up with lately. Have you been trying to land a meeting with a particular client? Tear out a page from a calendar, wrap it in a small box and attach the "let's take time to meet" tag. Do you need to make amends with someone? Tie the "meet me today" tag to some flowers. 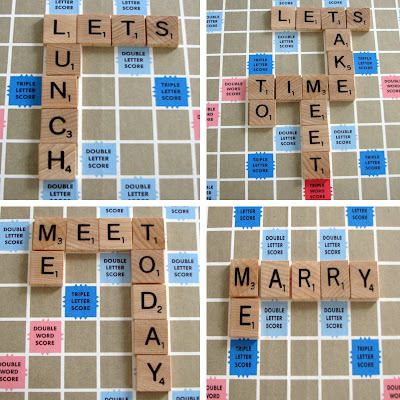 Looking for a fun way to propose? Hide the ring inside the letter bag and wrap up the scrabble game with this tag. 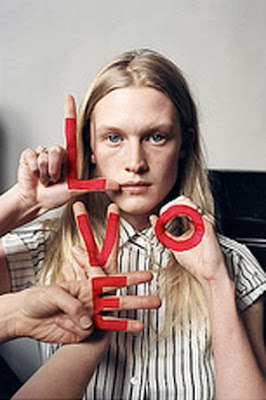 After I posted this morning, I came across this great photo by the British photographer, Tim Walker, over at maquette. It compliments what I was saying earlier and shows you how to take it to another level. If you want to find out a little more about him, click here or you can see more of his inspirational work here. Thanks Samantha for adding further inspiration. Here is this week's gift of gab quote. I immediately thought of sunglasses when I read this. Need a birthday gift? Write the quote on the tag and wrap up a pair of trendy sunglasses. These vintage inspired shades are from kate spade. It is summer after all. Since Dad won't be stopping for directions, make sure you have a map. These designer maps have found the intersection where practicality and design meet. The artist will create one for you of any longitude and latitude. 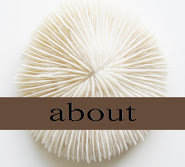 Some possibilites of their use are parties, relocations, housewarming gifts, weddings, and any other memorable locations....where all the details count. Once you get there, spend some time with Dad this Father's Day. Time is always the greatest gift. Happy Father's Day. 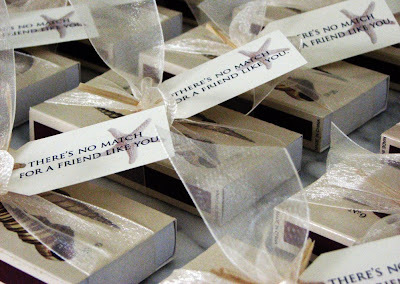 Matches are a tried and true favorite for favors. I have always loved their universal appeal and of course, their endless options of whimsical sayings. These were put together for a beach themed birthday party. Sometimes, all it takes is a simple and cleanly presented thought. I love to read Living,Etc. magazine. The photos are always clean and full of inspiration. This particular photo is not a new one. It was in the July 2007 issue. I like it because the photo is so simple, but makes a strong design statement. It is clean, but with a bit of whimsy. It has the same principles a great gift should have. It always baffles me when I'm at a place like the mall or even Starbuck's and there is no recycling. Think of the amount of trash places like that generate daily...hourly. Set up a corner in your kitchen or garage where everyone can take part. The habit starts at home. 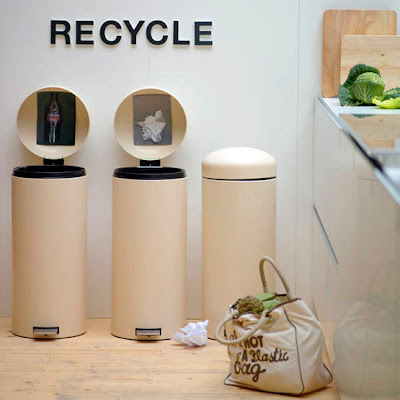 Recycling really is regifting at it's finest. P.S. Yes, that is "THE" bag that was all the rage not that long ago. 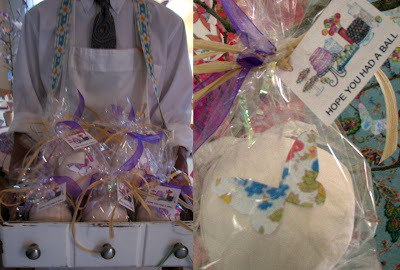 I am often on the "look out" for well designed items that can become well designed creative gifts. With Father's Day coming up this weekend, I thought I would post a couple of fun ideas. This set of playing cards is designed by Tools Design. The Danish design team, Claus Jensen and Henrik Holbaek, are two of the most established designers in Denmark. The illustrations on the face cards will certainly improve the look of poker night. They come in a plastic case to protect the cards or to be used in half and stack the cards during play. 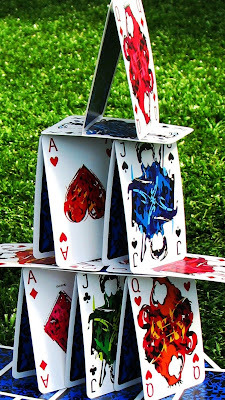 So if you have someone who plays their cards right, these are the perfect combination of appearance and function. Take it a step further and include the poker chips. This second idea is a fun way to let Dad act like his favorite "western bandit". 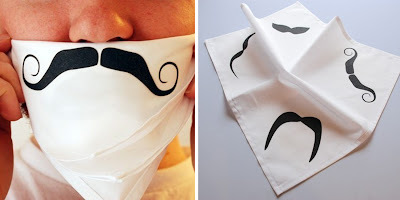 Created by Avril Loreti, this handkerchief would pair well with a beautiful new razor or natural shaving cream. You can even make your own shaving cream for that extra handmade touch. You could put on the tag something like, "We know how attached you are to it, but we love you for shaving it, so here's a way we can all be happy." You can find the moustache hanky here. "Our heads are round so that thoughts can change direction." Write the quote on the gift tag and give it to someone going through a change in their life. Maybe it is a new job or a big move or even a divorce. Okay, now for the gift. 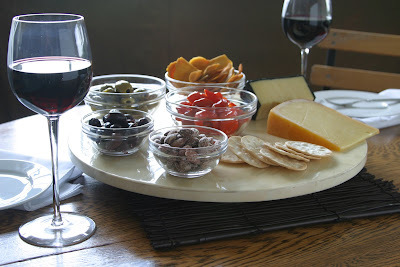 Drum roll please....a lazy susan. These are not your Grandmother's lazy susans. These are a modern spin on an old fashioned favorite. I have one of these at my kitchen table and we all love it. The conversation keeps moving and my kids can turn it and reach what they need without feeling like they are interrupting. A decorative and extremely useful gift that changes direction. These lyrics of Alice Cooper's have been the theme song in my house this week. Today is the last day of school. I have waited to post this thoughtful teacher gift. I know...I know...what is the point now, but I didn't want to have to put up a spoiler alert. This is the sort of thoughtful little gift that can be applied to all those occasions when you just want to express a simple sentiment. The wishbones are so versatile. You can slip the word "wish" into many scenarios. I "wish" you a great summer. I "wish" you could be my teacher next year, too. May all your "wishes" come true. I "wish" you were feeling better. 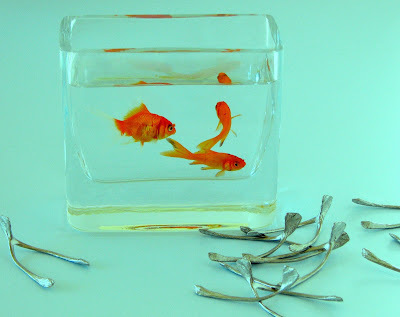 If "wishes" were fishes, I'd cast my net in the sea. Okay, I could go on for a long time here, so I'll let you think of some on your own or email me and I'll send you a list. You'll "wish" you hadn't asked. Last Saturday, we all piled into a couple of cars and drove a couple of hours north to see the space shuttle launch. On a clear day, we can see the trail of fire and smoke from where we are, but my husband has always wanted to see it a little more up close and personal. Since Sunday was his birthday, I thought it would be a nice family day. Let me just say, it was as beautiful as it was amazing. Are you asking yourself where the gift is in this? Well, I'm getting to that...albeit the long way. Anyway, one of the shuttle's missions is to deliver a part to the International Space Station so it can repair the toilet that went on the fritz a little over a week ago. Now there's a gift with special delivery and packaging! Our mission is to be sure that every gift you give is that warmly received. The debate over whether it is okay to send emails or handwritten notes has been thrown a curve ball. Did you know that you can have a font created of your own handwriting for just $9? Fontifier.com turns a scanned sample of your very own handwriting into a font you can use as text on your computer. Okay....I love it when there are so many possibilities. Preserve your child's handwriting, invitations, thank yous, a special note, even a secret language made up of symbol's are just a few ideas. This is the sort of thing that really takes a gift to a meaningful level. Fontastic! Since we're talking about favors, it's important to note that they can be done in all price ranges. The point is to always make that lasting impression. I was recently asked to help put together favors for a school auction. The theme was Have a Heart for your school. It was important to make it meaningful, but keep the price down. After all, the school was trying to raise money. We found cereal with hearts in it and focused on the packaging. I can't say it often enough...presentation is everything! You will also find very quickly that I am a lover of words, quotes, phrases, etc. The proper wording can bring a thought full circle and bring your theme together. On Friday, I promised to show you the favors from the Dessert party. 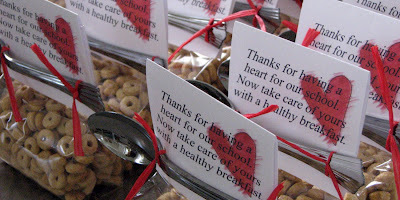 Favors are something we love to personalize to the event. Customization and presentation is key with favors. It's a way to continue to remind your guests of you and your event. This applies for kid's birthday parties to corporate events. 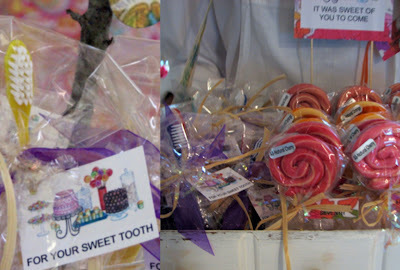 We just knew after all the sweets at the dessert party, it would be fun to have toothbrushes as a favor. We packaged them with tags that said "for your sweet tooth". Each girl also received an all-natural lollipop and a surprize ball. The surprize balls were personalized to match the party by adding butterflies to them and tags that said "hope you had a ball". Check out the surprize balls on our site for more ideas of how to incorporate them into your next event. I'll be showing you lots of party favors of all kinds from time to time. We have many options on our site, but we also have many options available to us that you won't see there. Again, customization and presentation is the key. Favor: 1. an act of kindness beyond what is due or usual.